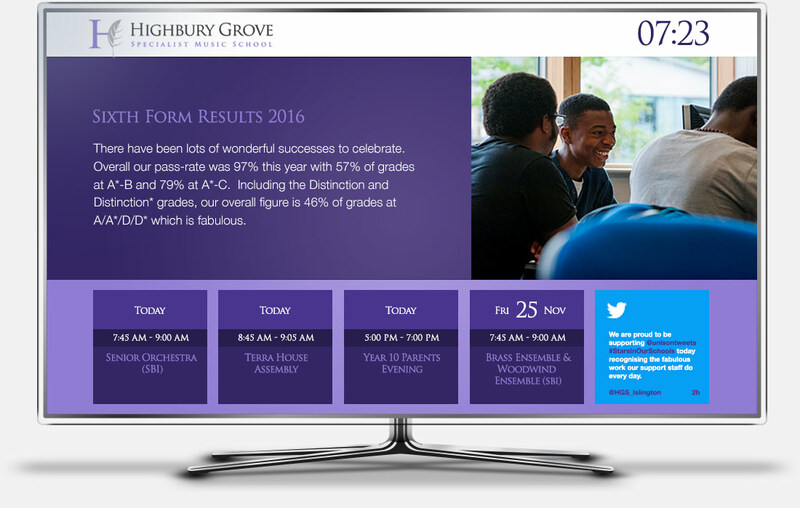 Do you have a large digital display hanging around school gathering dust? Would you like to visually engage with your visitors in the reception area? We can design custom digital displays that never need updating! Sounds interesting? We hate the thought of duplicating the same news story across multiple media. It goes against our core values, which is why we design our digital displays to naturally pull information from the school website and social media channels. Therefore, you never have to update the digital display. You simply tick a box when you create your website news stories and it’s done. As with everything we do, each one of our digital displays is custom and designed around your requirements. There is no template. Perhaps you want a ticker tape showing announcements, or a feed of BBC news? Whatever the need, we’ll find a way of presenting the information you want in an elegant and concise way. For obvious reasons, the digital display must be connected to the internet in order for our solutions to work effectively. This service is also only available to clients who already have a Creative Schools website. It pulls in latest news (five most recent stories), upcoming events and twitter. Every twenty seconds the news story and tweet changes to the next in the sequence.